I don’t see my queerness or my non-binaryness as the only relevant thing about me. But often, without my consent, it becomes the only thing relevant about me for others, especially in public, which in turn forces me to constantly perform to be allowed some basic things. I am sure that whatever I will say from here on is nothing new. I’m sure there are many who have had experiences similar to mine. But there aren’t many who get to speak about these experiences. And I think it might be time that I did. If one wants to go with terms and labels and stuff, I would say that I’m queer, and I’m non-binary. I find the term ‘woman’ very limiting for how I feel about my gender. 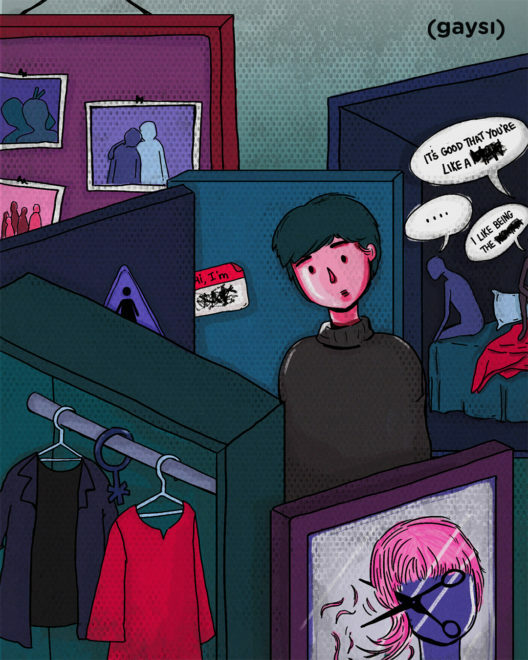 Even when I didn’t know the other non-binary, I often felt like an outsider among ‘women’. There was constant negotiating needed then and there is constant negotiating needed now, albeit for a different reason. I went to a college where I had to compulsorily wear kurtas. “For my own good” of course. My way of dealing with this forced femininity was to become hypermasculine in other spheres of my life. Toxically masculine even. I refused to wear bright colours even when I wanted to, refused to ask for help, refused to cry especially in front of people, showing emotions overall was a no-no, and have been in unnecessarily dangerous situations. Back then, I revelled in “you’re not like other women”. I’m not saying that that was good for me or is the right way to go about things, but that is what helped me cope then. The funny thing is, I was always queer, but no one ever asked me my pronouns when I had long hair, as if that simply covered up whatever else I said. I don’t see my queerness or my non-binaryness as the only relevant thing about me. But often, without my consent, it becomes the only thing relevant about me for others, especially in public, which in turn forces me to constantly perform to be allowed some basic things. Laugh along with women smile apologetically after asking me to leave public restrooms, because of course I should forgive them! Be okay with security guards who may want to check me extra thoroughly regardless of what I’m carrying. Because I look the way I do, sometimes even queer and feminist spaces require navigating. Do I really want to put my pronouns on my name tag and have that conversation with everyone who thinks it’s a free discussion topic? Why do I have to keep speaking out for everyone to be ‘correct’ and ‘comfortable’, and so that they don’t make mistakes? What is so wrong about making mistakes and then apologising? After a date, we were back at her place, and fooling around. When things were just getting heated up, she says, it’s a good thing that you’re like a man in bed because I like being the woman. Cold. Everything simply goes cold, and I leave from there. “You shouldn’t be afraid. Just accept that you’re transgender,” says a queer activist, well meaningly I’m sure. But putting me in a box and then another box and then another one is not well-meaning. But I must admit, it hasn’t been all bad and sad. I have enjoyed the extra armrest space when people think I’m a man. Till they see my chest and a hint of breasts. I’ve enjoyed the quick service in shops, and the fact that auto and taxi guys don’t argue about the routes which I ask them to take. Till then hear my voice. *facepalm* Are these good things? Of course not! But please don’t begrudge my very momentary joys. They are so rare…. When I was asked to write about my experience, I agreed to it because I didn’t have these stories when I was growing up. I didn’t know anyone else like me for a very long time. Even now, I know how much time it took me to find people, chosen family, potential partners, friends, who got me and accept me and celebrate me as I am. Yeah yeah, they think I should clean my room more often or that I will look nice in brighter colours, but eh. *shrug* I was and am terrified to be here but I think I need to do this, for the 12 year old me, the 15 year old me, 21 year old, and the current me, and for all those who are looking for these stories. 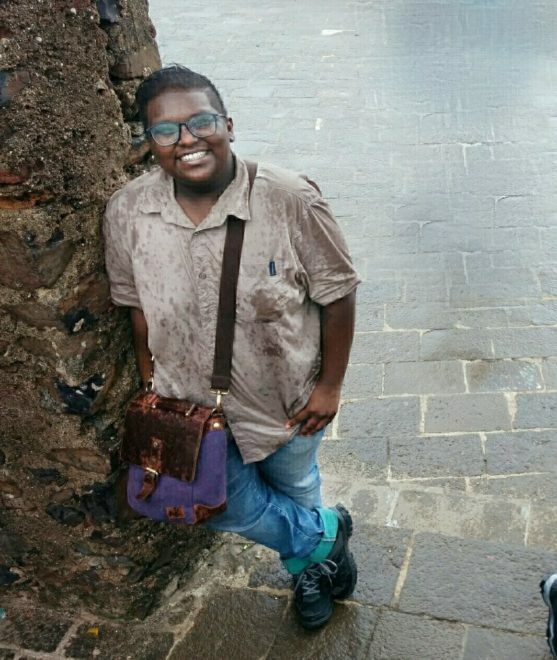 Smita Vanniyar is a queer feminist, currently working at Point of View, India, on gender, sexuality and technology. They hold a Master’s degree in Media and Cultural Studies from Tata Institute of Social Sciences, Mumbai. Their areas of interest include gender, queer studies, Internet, technology, popular culture, films and TV shows, fandoms, etc. Smita can be found wandering the cyberspace, or hunting for good coffee.